Nearly five months ago, major retailer pulled “hoverboard” scooters from shelves after the Consumer Product Safety Commission said the not-actually-hovering devices were unsafe unless they met certain standards. Now the federal safety agency is announcing an official recall of around 501,000 hoverboards. The CPSC, along with eight manufacturers and two retailers, agreed to recall the hoverboards over fire hazards posed by the devices’ lithium-ion batter packs. According to the CPSC recall notice, the lithium-ion battery packs in the self-balancing boards could overheat, start to smoke, catch fire, or lead to an explosion. There have been at least 99 incidents reported to the CPSC of the battery packs in self-balancing scooters/hoverboards overheating, sparking, smoking, catching fire and/or exploding including reports of burn injuries and property damage. Kaye said on Wednesday that the CPSC has investigated more than 60 hoverboard fires in more than 20 states that resulted in more than $2 million in property damage. “To prevent another fire and possibly a death, I am urging consumers who have a recalled hoverboard to take advantage of this recall,” Kaye said. Additionally, 4,300 boards are being recalled from Overstock.com, while another 1,300 Orbit boards are being recalled from Boscov’s. The recalled hoverboards were manufactured in China and sold mostly online from June 2015 to May 2016. The official recall of the self-balancing scooters comes after months of back and forth between manufacturers, retailers, and safety officials over the safety of the devices. Issues with the boards began around the holiday season when many who received the devices as gifts reported they had caught fire or exploded while being plugged in to charge. 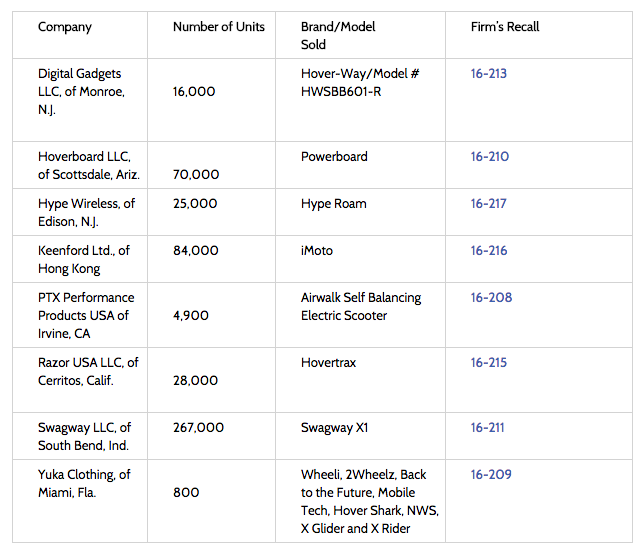 In January, the CPSC announced it was investigating 13 hoverboard companies. Engineers with the agency are testing hoverboards – both new models and those involved in fire incidents – at its National Product Testing and Evaluation Center. A month later, the agency said that over a two-month period it had received reports from consumers in 24 states of self-balancing scooter fires, including the destruction of two homes and an automobile. The agency then notified retailers, manufacturers, and importers that self-balancing scooters are not safe unless they meet certain standards set by the Underwriters Laboratory. Shortly after that, retailers, including Amazon, Target, and Toys ‘R Us, began removing the devices from their physical and online shelves.